It’s November. The weather is getting colder so it’s the perfect time to start cooking warm meals for the entire family. This week’s features have been chosen by Randa from The Bewitchin’ Kitchen. 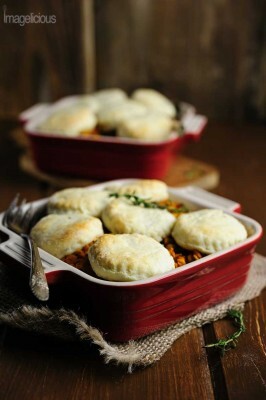 My first choice is this Vegan Lentil Pot Pie from Imagelicious. I discovered lentils last year and I haven’t met a dish I didn’t like. I try to cook meatless once a week (“meatless Monday”) to give wallet a break, and I figure it’s good for the digestive system as well. 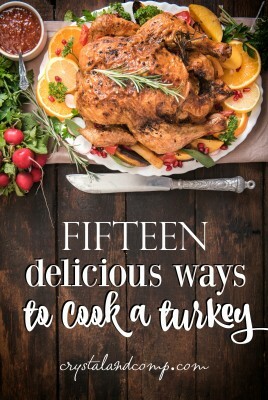 One of my favorite blogs to visit, Crystal & Co, has come up with this fabulous turkey roundup: fifteen delicious ways to cook a turkey. American Thanksgiving is just around the corner, so I know that this is coming just in time for some of you. For the rest of us, Christmas is only a few weeks away. This is definitely something to bookmark for future turkey roasts! 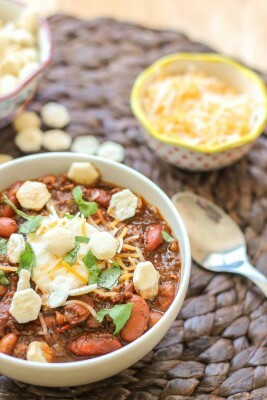 As soon as I saw this Chorizo Chili with Jalapeno Cornbread Waffles on last week’s Monday Funday I was so excited (food does that to me). This recipe is from Strawberry Blonde Kitchen and is pure comfort. I never thought of making waffles savoury before and this has opened so much inspiration for me. Link up to the linky form below to grow exposure to your blog. Your posts will be posted across four blogs: The Bewitchin’ Kitchen, Merry About Town, MyBabyStuff and Ninja Mommers. Once a week one of us will showcase and feature 3 blogs. By linking up to the Monday Funday Linky Party, you are giving all 4 blogs permission to use your with credit given back to you. Thank you so much for the link to the Turkey Recipes, not only are they there, but there is also a link to 25 Desserts Perfect for Thanksgiving that includes at 4 recipes I want to try! The Apple Bundt Cake with Caramel Glaze Recipe looks amazing. And fattening, but, oh well.